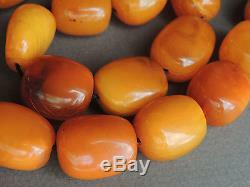 Old Butterscotch Honey Amber Barrel Beads. These beads are simply strung on simple string, can be used to create a necklace. Very good color and marbling to the beads. Smallest bead measures 19.5 mm x 16.5mm. 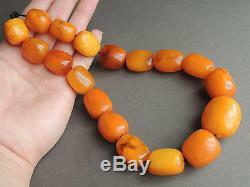 Largest bead measures 27.5 mm x 20 mm. Section with beads measures 15 3/4 inches from end to end. Total weight of 80 grams. 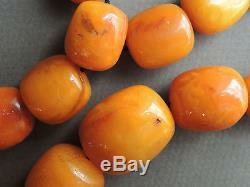 Beads are in good condition, there are some chips to some of the beads, please take a look at the images for reference. 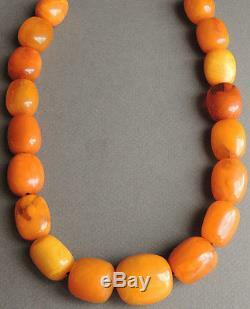 Beads are barrel-like but are irregular as they seem to have been carved by hand. 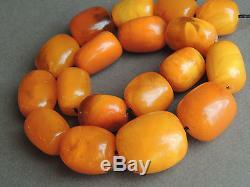 These beads are old, visible age and crazing to the beads. 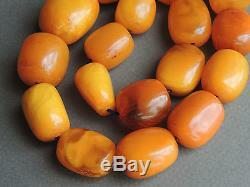 If you are looking for new/perfect beads with no damage or imperfection these are not the beads for you. 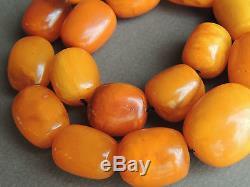 The item "Natural Butterscotch Honey Amber Barrel Beads for Necklace 80 grams" is in sale since Thursday, February 16, 2017. This item is in the category "Jewelry & Watches\Vintage & Antique Jewelry\Fine\Retro, Vintage 1930s-1980s\Necklaces & Pendants". The seller is "blackonyx-88" and is located in Stockton, California. This item can be shipped worldwide.